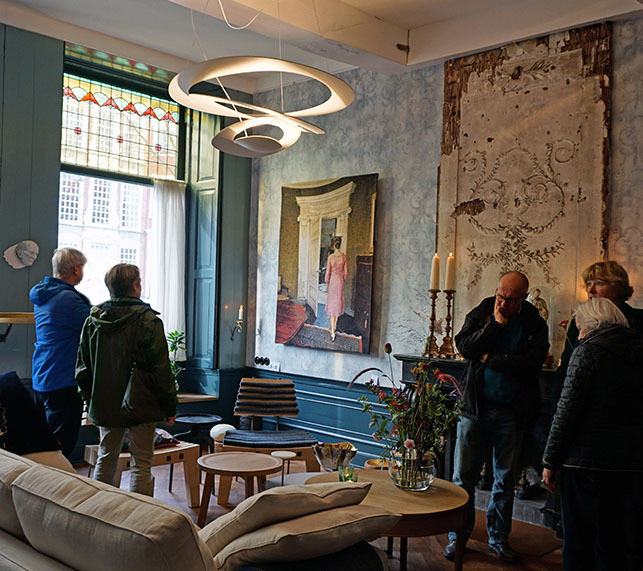 One of the high-spots of the social and artistic calendar in Delft has become the twice yearly KunstKamer held in a five-hundred-year-old private house on the city’s Oude Delft canal. Each May and November Ramon Dykgraaf and his partner Marc Cals throw open their doors to the public to show the work of half a dozen artists. The shows are organised with Joke Doedens and Simone Haak who run Galerie Terra in the city. The current exhibition shows the work of sculptor Frode Bolhuis, ceramicist Mieke de Groot, object maker Johanpeter (JP) Hol, painter Henk Metselaar, paper artist Anne Rijnders along with the drawings of Wilma Stegeman. The ground floor of the house provides the perfect venue to show the works. Many of the original features are still in place, including two early plaster chimney breasts and a kitchen containing an ancient brick solid fuel stove. KunstKamer started when Joke and Simone celebrated the thirty-year anniversary of their gallery by creating a chambre d’amis which took place in several houses including the one in the Oude Delft house and from that KunstKamer was born. The exhibitions always feature ceramics, in which the Galerie Terra specialises, but all other art forms as well. They exhibit artist from within the Delft area but they also visit art fairs and galleries around the world searching for new artists. All the works are for sale with a price range to suit every pocket. Ramon originally planned to become an artist but at the last minute thought better of it and gave up the place he had won at art school and trained as doctor instead. He is now a gynaecologist at the prestigious Erasmus MC University Hospital in Rotterdam. He still paints in his spare time and has a studio in the house. 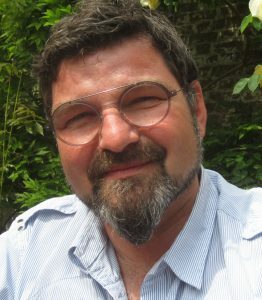 His work will be shown in KunstKamer in May 2019. The typical KunstKamer weekend welcomes between 500 and 600 visitors. ← GROSCHENBLUES at Operadagen at Rotterdam Schouwburg.